A group of enthusiastic MIT students visited our schools for a week to learn and to be taught. 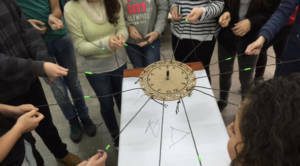 This is part of an MIT’s MISTI project which sends students to various countries for a month, giving them the opportunity to learn about educational methods and styles, and in turn, for them to contribute to the development of education in the international community through interactive learning. Our schools have hosted MIT student groups over the last few years, with a great exchange of ideas and learning on both sides. 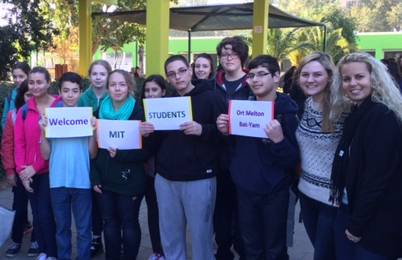 Exposure to students from the prestigious MIT is far more than a wonderful educational event for our students. It is eye-opening, it expands the teenagers’ horizons and inspires them beyond their immediate daily studies. Israeli MIT student, Avital Fisher, who is studying Biological Engineering, neuroscience and cognitive development, told Kramim Sci-Tech students that the school’s Physics lessons she attended was at a very high level compared to what she has seen internationally at school level. She said she really wants to show Israeli youth that if they work hard, they can also study in this prestigious institution. Our students taught them about our innovative program, i-STEAM (innovation-Science Technology Engineering Arts and Math). In turn, the MIT students showed them projects they are working on, including one with Google. Together they explored a wide range of fascinating issues from self-driving cars and robots to a mathematical origami project. They discussed business skills development, so that our students can learn to produce ideas and inventions which address problems in the world; and even learnt to write their names in DNA code.